It’s cold, rainy, and perfect weather to crank the ovens for this recipe. 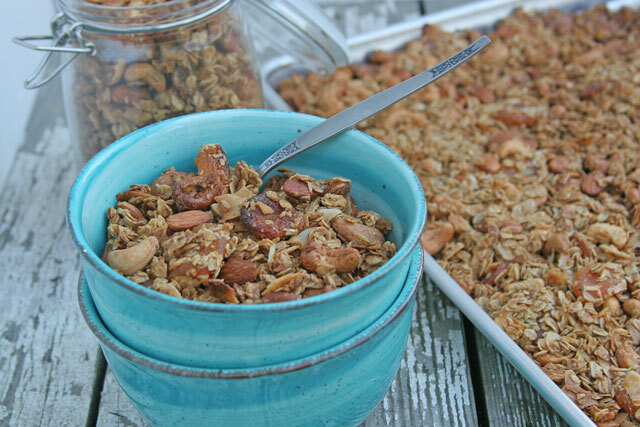 I make this granola throughout the year, using different ingredients, typically seasons flavor. So for now, I’ll stick with this exact recipe. I love the maple syrup and cardamom. It exudes Fall and makes me feel cozy. I topped my oatmeal with a scoop of this for a different texture, with a fresh pear diced in there. Breakfast bliss. This recipe is a mish mash of sorts. But a good ratio to granola is a must, and having a simple guideline to follow when making granola is helpful. I am a fan of Marge granola, and I like her ratios. So I used her recipe as a guideline to making my own take on a great granola. With many things I make, feel free to try your own combinations of dried fruits, nuts, coconut, sweeteners and spices. Try and try again until you find your favorite I like making different flavors often, so this is just one. I made a huge batch, like with everything else, so cut back if this seems like too much for you. I gave some away as a gift, hence the big batch. Oh, this makes a wonderful gift. In a bag tied with twine, or in a mason jar is always awesome. 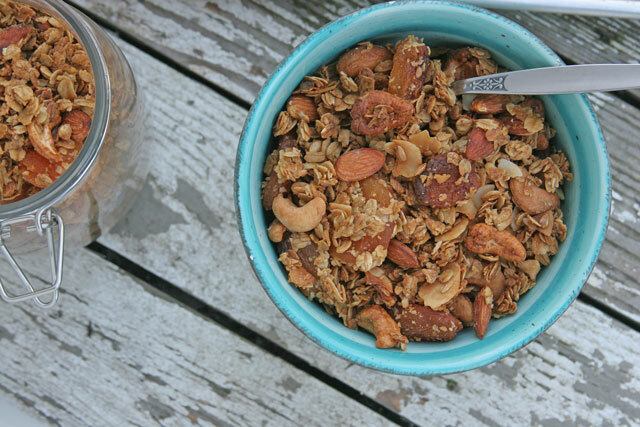 This granola will keep in an air tight container, or bag for about two weeks. After two weeks, it keeps best in the fridge. This is beautiful and nutritious way to start your morning. I serve mine over yogurt or with milk. I often add more fresh fruit, whatever is in season. Right now there are some amazing apples around. Add chopped apples and dust with a touch of cinnamon or cardamom. Use berries when in season for a pop of colored foods which are rich in anti oxidants. 1. Place parchment paper or a silpat on sheet pans. Use two sheets for this large of a batch. Use one if you are doing half of this recipe. 2. 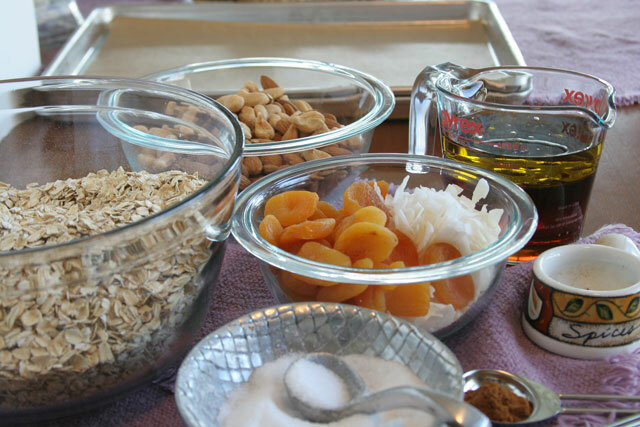 In a large bowl, combine the oatmeal, nuts, coconut, and dried fruit, mix well. Add the salt, cinnamon, and cardamom to the oatmeal mixture. Mix very well. In a separate bowl combine the olive oil, sweetener, and vanilla, mix. Add the liquid mixture to the oatmeal mixture and combine well. 3. For entire recipe: Divide the large batch between the two sheet pans, evenly distribute the oatmeal mixture on sheet pan, and pat down gently. 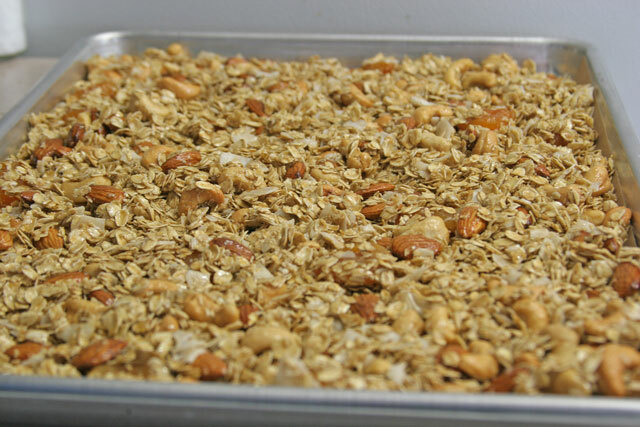 For half recipe: Distribute the oatmeal mixture evenly onto sheet pan and pat down. 4. Bake at 350 degrees for 40-50 minutes Stir at 20 minutes, and give the sheet pans a turn. If you like your granola clumpy, like me. Do not stir, but do turn the sheet pans. At 20 minutes my apricots were burnt. Had to pick them out. Is 350 correct? I took the granola out at 20 minutes to prevent further burning. Even some of the nuts and oats were beginning to burn. However, I absolutely love the granola and will make it again but bake at 250 and add the dried fruit later. Jean, thank you so much for letting me know. That is not good! That granola is soooo god, but I so sorry that it didn’t work out for you. I hope you were able to salvage it! The granola turned out fantastic! It made the whole house smell divine! I added pecans in addition to the cashews and almonds but other than that followed the recipe as is. Thanks! Hi Fabi!! I am not much of a coconut fan. If I omit it would I need to make any other alterations to the recipe? Hi Brookie! Not at all. You could put a little extra dried fruit. But totally not necessary. You will love this, it’s so addicting!